Reading over this housekeeping resume sample and the writing tips below can help you find a job more quickly. However, if you’re really short on time, be sure to try out our free, easy-to-use resume generator. Want to make sure your resume grabs your employer’s attention? Our stylish resume templates will do the trick. Hotel housekeeping employee with over nine years of experience in providing excellent housekeeping services in hotel settings. Seeking to bring my expertise and high performance standards into a managerial housekeeping role. Certified Executive Housekeeper. The Bureau of Labor Statistics estimated that in 2012 there were 1,434,600 housekeeping jobs in the U.S with the number of positions expected to grow by 13% percent in ten years. Employers look for candidates with key characteristics, such as interpersonal skills, leadership, and proven customer service skills. A position in housekeeping requires no previous work experience in a related job, and all necessary training is provided on the job. Most entry-level housekeepers team up with more experienced cleaners until they’re able to take on their own responsibilities. With some years experience, seasoned housekeepers may look to take on a more managerial role on a team. In addition to a demonstrated proficiency in housekeeping, employers look for candidates with key characteristics, such as interpersonal skills, leadership, and proven customer service skills. 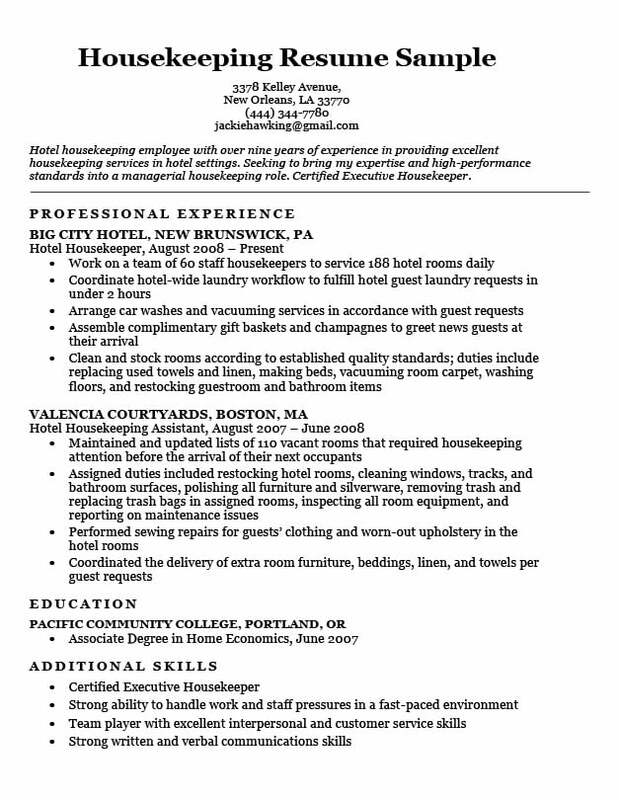 Our sample resume is an excellent example of how you can present your years of housekeeping experience for that managerial role. Below we’ve listed out some guidelines and major considerations to help you craft that winning resume. The top of your resume is prime real estate. Here you should craft a strong career objective to clearly communicate how you are a good fit for the position you’re applying for. In other words, employers should be able to read your career objective and get a good feel for your job qualifications and your job-seeking intentions. Housekeeping employee with over nine years of experience in providing and overseeing housekeeping services in hotel settings. Seeking to bring my proven expertise in housekeeping and in providing excellent guest-oriented services into a managerial role. The career objective functions as a preview and a summary of the body of the resume. Our career objective guide breaks down each line of the resume introduction and helps you write your own. 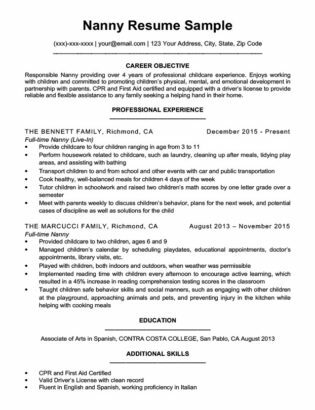 The body of the resume. It’s very tempting to just fill the page with a long list of your past work experiences. When you write out your past work experiences, a concise description is much better than a long, exhaustive list. You actually need to be very strategic about what you put on the body of your resume. When you write out your past work experiences, a concise description is much better than a long, exhaustive list. For one, a thoughtful list reflects thought and mastery over your job. It also allows you to direct the reader’s attention to your most impressive skillsets and capabilities. Simply listing out duties makes it sound like you’re just told what to do, but using achievement oriented language makes you sound like a professional. The difference is tremendous. Our applicant used words such as “coordinate”, “arrange”, “assemble” to indicate that she not only takes initiative, but that also has the ability to see the work through. This is especially important for the managerial position she’s applying for. Notice that at the end of the list she also includes specific tasks to demonstrate that she has mastery over the basic housekeeping competencies. Why is it important to quantify your experiences? In short, presenting hard numbers indicate to the hiring manager that a real reference point to gauge your skillset achieve and also proves to them that you are able to achieve solid results. Our applicant writes that she “works on a team of 60 staff housekeepers to service 188 hotel rooms daily”. These numbers give more strength for her achievements, and also provides a solid context her job skills and work capabilities. Not sure which resume format is suited for your unique professional experience? Read our resume formatting guide to help you choose the best one for you. Consider this a space for you to list out other soft or technical skills that you haven’t stressed elsewhere on your resume. Think about what skills or even personal characteristics will make you a strong candidate for the position you’re applying for. In this case, our candidate emphasizes the ability to work “in a fast-paced environment” and being a “team player with excellent interpersonal skills”. Both of these are targeted for the managerial position.